I'll admit, I know very little about politics. 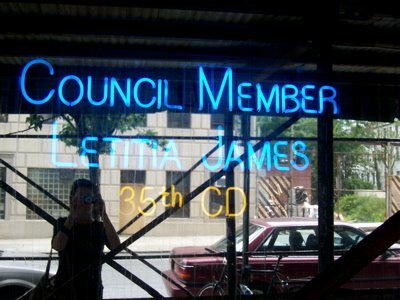 What I do know, however, is that Councilwoman Leticia James is a very visible fixture in the community. I emailed her a detailed list of questions and she called me back the very next day! She went through my list verbally, as she's obviously short on time. Props to her for being so quick to give a few minutes to a neighborhood blog! We hear a lot about "affordable housing." What exactly does that mean? Who actually qualifies? I get the feeling that the "NYC middle class" (who, in any other part of the country would be upper-class based on income) are left out of the equation, meaning single people making less than 80k or so. The affordable housing Ms. James currently works on covers individuals making between 30 and 60k/year. She also works with PACC and non-profit groups on affordable housing initiatives. What amenities do you feel are lacking in the neighborhood? Successful public schools. She hopes her legacy will be the renovation of all parks in her district, as well as meeting the needs of those in public housing. These people have long been ignored, which she feels contributes to the higher crime rate concentrated in these areas. What would you most like to see open up here? "NOT Atlantic Yards!" She'd prefer a bookstore, ice cream shop, drug store, and "Crate and Barrel and Ann Taylor," two of her personal favorites. How do you envision Clinton Hill ten years from now? A continually diverse community, where we celebrate children and families. Name a few adjectives you would use to describe Clinton Hill: "Brownstoney (is that a word? ), diverse, community-oriented, active." Hobbies and interests: Reading, walking to book stores in Park Slope, attending church in the neighborhood, a new interest in studying architecture specifically relating to the neighborhood, visiting schools and stopping into police precincts to thank them for their hard work. Councilwoman James asked me to remind readers that the primaries are just seven days away! She is endorsing Bill Batson for Assembly, as she feels he'd be a great partner: independent, values the area and most importantly shares her concerns about Atlantic Yards!